Which horse has the best pedigree to handle twelve furlongs in the final leg of the Triple Crown on Saturday, June 9 at Belmont Park? My Belmont Stakes alphabetical list starts with graded winner Alpha, and you would be hard pressed to find better bloodlines. Alpha’s sire Bernardini raced just one season but he certainly made a splash in 2006. In his 3rd career start, he won the G3 Withers and followed that up by capturing the G1 Preakness, G2 Jim Dandy, G1 Travers, and G1 Jockey Club Gold Cup. He finished his career with a runner-up effort behind Invasor in the G1 BC Classic. As a sire, Bernardini was represented by three grade one winners in his first crop, including his son Stay Thirsty, who finished 2nd in the 2011 Belmont Stakes. Bernardini’s sire A.P. Indy won the G1 Hollywood Futurity in 1991 to end his juvenile season. In 1992, he captured the G2 San Rafael, G1 SA Derby, G2 Peter Pan, and G1 Belmont Stakes. I’ll Have Another will take one final step in his quest for Triple Crown glory in the twelve furlong Belmont Stakes at Belmont Park on Saturday, June 9, 2012. There is no shortage of fresh horses waiting for him in the Test of Champions including my top ranked 3-year-old Union Rags. I have always thought that Union Rags was the most talented colt of his generation and he is already a grade one winner at Belmont Park. His new rider John Velazquez won the Belmont Stakes in 2007 aboard Rags To Riches and the Michael Matz trainee could play spoiler on June 9. Dullahan is a 2-time grade one winner and was last seen rallying for the show in the Kentucky Derby. He can seemingly run all day and looms a late running threat under new pilot Javier Castellano. Alpha loves the Big Apple and owns a long winded pedigree. He finished 12th in the Kentucky Derby but could go much better at Big Sandy. His trainer Kiaran McLaughlin saddled 2006 Belmont Stakes winner Jazil. Bodemeister is getting a rest but trainer Bob Baffert could be represented by late bloomer Paynter. The G3 Derby Trial runner-up earned a 106 BSF in a romping allowance win on the Preakness undercard at Pimlico on May 19. 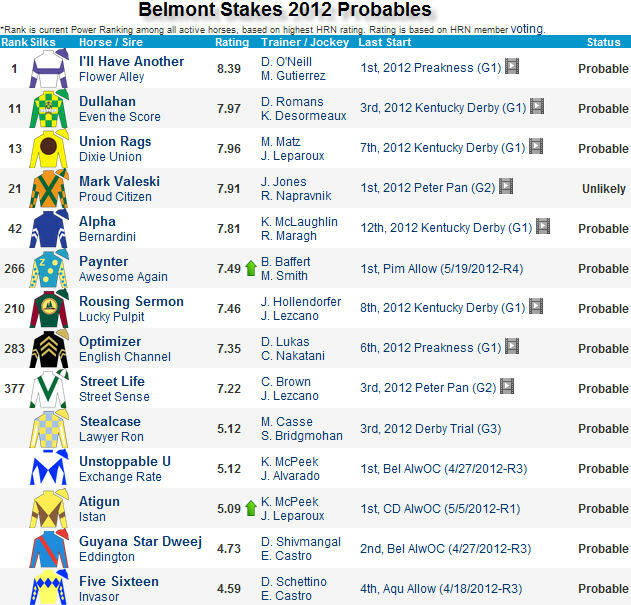 At this stage at least a dozen horses are aiming at the Belmont Stakes. Check out Horse Racing Nation for all of the latest Triple Crown news and I’ll post daily blogs here with updated Belmont Stakes news. Play the Derby Wars $10k Preakness Day game and $1,000 survivor. We have a $10,000 Preakness Day game on tap for Saturday. The buy in is $77 and the payoff goes down to 29th place. Also scheduled for Saturday is our $1,000 Preakness survivor. The Derby Wars survivor games are a great value. The buy in is $4 and you can purchase up to three entries. If you selection finishes 1st, 2nd, or 3rd, you survive to the next contest race. First place gets $750 and second place brings home $250. As usual, I will be joining Steve Bortstein on the Fast Track this weekend. The show airs weekends at 10am ET and we do frequently go over the following hour by about 5-10 minutes, so we’re not automatically done at 11am ET. I will also be joining Steve on Friday morning to start the Preakness discussions early. Click here to listen to the show. Check out HRN for updated Preakness 2012 news, including results, recaps, videos, and selections. For Friday, I posted free analysis of the Black-Eyed Susan Stakes and Pimlico Special. Saturday’s Pimlico free selection is the Alaire DuPont Distaff Stakes. Friday night’s Betfair Hollywood Park Pick 6 Tickets are now available for your viewing pleasure. It looks like a moderately tough sequence and make sure to check back for Saturday’s Pick 6 tickets as well. In addition to my Pick 6 tickets, I am also now including a best bet and live longshot for each Hollywood Park program. I am offering full card analysis for Preakness Day on my Today’s Racing Digest Handicapper Page. The cost is $10 and includes wagering strategies for all 13-races. 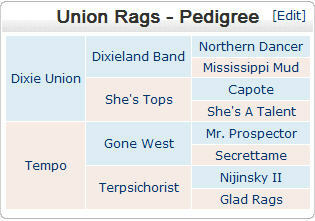 I have also posted a bonus Saturday free play (Pimlico race 8) on my Digest Handicapper page (click view sample).